Freezer stir-fry kits are an excellent way to spend less time cooking dinner, while also saving money on take-out or running to the grocery store last minute. You will love how delicious and healthy this stir-fry is that you’ll be making these kits all the time! Be sure to snag the free shopping list and all the recipes at the bottom of this post. When I had just two kids, I was constantly pulling my hair out while making dinner. Two toddlers running around and “helping” as much as they could was a bit stressful on even the best of days. Three months in with three kids, and I’ve pretty much reached a point where I sometimes can’t even chop or dice anymore during the “bewitching hour.” Dinner is frequently on the table later than I’d like, and sometimes it’s not exactly what I had planned to make. Of course, this is my own fault for being overly ambitious with dinner. I mean, cooking is my favorite part of being a homemaker so I do tend to go overboard and choose meals that take a bit of time to pull together. But, truly, it’s time to start utilizing other cooking methods, am I right? That’s why I’m trying freezer meals for the first time (I’m talking intentional freezer cooking “days” rather than just doubling a recipe and throwing it in the freezer). 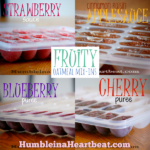 Freezer meals are such a great alternative to spending time each weeknight making a healthy dinner. Today I’m sharing the process of making freezer stir-fry kits, which are both healthy and delicious, so you can enjoy a homemade dinner without the added stress. I’ve been making stir-fry a lot lately. It’s a simple meal with endless possibilities. You can switch up the protein, veggies, and sauce and the method is pretty much exactly the same. What I realized, though, is that it was taking me a whole lot longer to cook just one night’s meal of stir-fry than it should. This was mainly because I was cooking while I had 3 needy children wide-awake. What should have taken me 40 minutes, tops, was taking at least an hour or more. 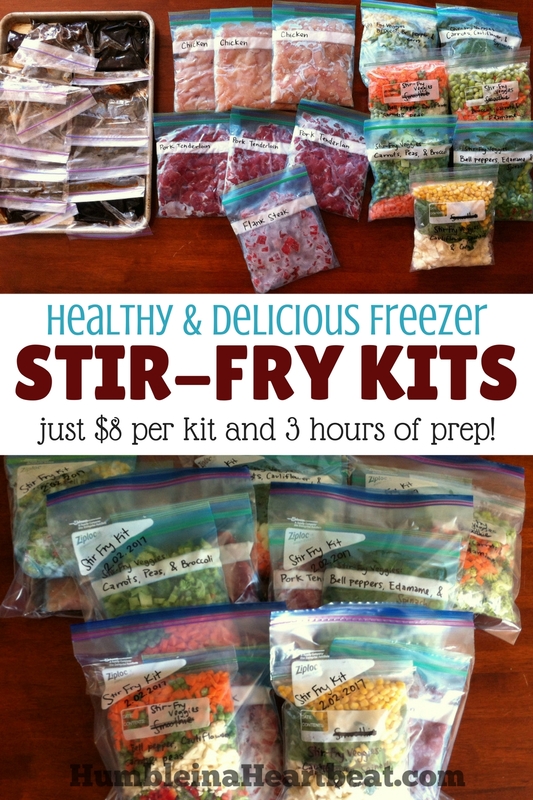 So I made it a priority to put together some freezer stir-fry kits right away. And I saw the benefits almost immediately. Those benefits seem almost too good to be true. But, I’m telling you, if you make it a priority to make some freezer kits, you will not regret it. Now let’s get to this tutorial! When I decided to make some stir-fry kits for the freezer, I had no idea how long it would take me to put them together. Fortunately, I was able to make them in just 3 hours, which is a lot better than the cumulative 8 hours it would take if I made them all on separate nights! I’m pretty much sold on freezer kits. There are 5 steps to making freezer stir-fry kits. You can really do the first 4 steps in any order you’d like. For the purpose of this tutorial, I’ll give you instructions exactly how I did it. But if you want to make fewer or more kits, just adjust where needed. Also, each kit makes enough for 3-4 adults. Get out all your ingredients: 2 cups soy sauce, 2 cups chicken broth, 4 T. cornstarch, 4 T. honey, 4 tsp. sesame seed oil, 4 tsp. rice vinegar, 8-inch piece ginger, and 8 cloves of garlic. Start by grating or mincing the ginger and garlic. I grated the ginger (normally I mince ginger), and I was a little surprised by all the fibers left, but that’s totally normal. Add all the ingredients to a medium bowl and whisk until the cornstarch and honey are incorporated. Those two ingredients tend to settle at the bottom so it’s worth it to spend some extra time making sure everything is well mixed. If the sauce is not already in a pourable container, put it in one now. You may put the sauce in ice cube trays to freeze or in sandwich bags (with zipper tops). I tried both ways and prefer the sandwich bags. Either way, you will still need to put the ice cubes into sandwich bags after they freeze. Fill each bag with at least 5 ounces of sauce (you may prefer more or less, but this is what I’ve found to be just right). Once you have filled all the sandwich bags or ice cube trays, put them in the freezer. I spent about 35 minutes making the sauce, with a lot of the time consumed by preparing the ginger and garlic. Take out all the veggies that you need to chop. I got out my carrots, bell peppers, broccoli, and cauliflower. I would have had celery and mushrooms as well, but I accidentally left them at my mom’s house the day that I bought them. The best way to prepare the veggies, in my opinion, is to chop each one and put it in its own container or bowl. Then, once you have finished preparing all of them, you can easily measure out 1-2 cups of each veggie for each stir-fry kit. In each bag, put 4 cups of veggies, any combination. I like to use 3-4 different veggies, usually. If I am doing a 3 veggie combo, I will add 2 cups of one veggie and 1 cup of the other two. Put all the bags into the freezer and go onto the next step. I actually only packaged 7 bags because the last combo was for dinner that night. Since I was already cooking, I figured I would just use what I was preparing and not stress about dinner. It took me about 1 hour to get all the veggies ready. I am quite a slow chopper, though, so it may not take you that long. You may or may not want to do this step. We love garlic in our house, so we like to add more garlic than is even in the sauce. However, when I was making these kits, I did forget to do this. If you want to add garlic to your stir-fry (in between cooking the protein and the veggies), then get out at least 16 cloves of garlic and start mincing. Put 2-3 Tablespoons of minced garlic into each sandwich bag. Put them in the freezer as is, or you can put a small amount of olive oil in each bag first. I have never had a problem freezing garlic without the olive oil. Plan on about 10 minutes to get all the garlic chopped if you are going to add it to your kits. You can make stir-fry with any protein you’d like, but we really like chicken, pork, and steak, so those are what I chose to use. You can also use fish, shrimp, or tofu. Get out your protein. I used 4 pounds of boneless, skinless chicken breasts, 3 pounds of pork tenderloin, and one pound of flank steak. If you want these meals to be more frugal, stick to using cheaper proteins or meat you found on sale. Cube the chicken and pork, and slice the flank steak against the grain. I actually just cubed the steak as well, but slicing it against the grain is supposed to make a much more tender meat. Label your quart-size freezer bags with the protein you will be putting inside and fill each one with about 1 pound of protein. I kept 1 pound of chicken out of the bag and put it on a plate covered with plastic wrap in the fridge for dinner that night. Put all your bags into the freezer. The meat took the longest amount of time for me to prepare. I spent nearly 1 1/2 hours cubing the chicken, pork, and steak. Once all your sauce, veggies, garlic, and protein have been prepared, it’s time to start assembling your stir-fry kits. Clear enough table space, and put out all the sauce, veggies, garlic, and protein in their bags. Get out some gallon freezer bags and label each one, if desired. I labeled mine with “Stir-fry Kit” and the date 3 months from the day I prepared them. The kits should be good in the freezer for at least 3 months. I like to glance at the bag and know when it will “expire” so I put a future date. You can also just put the date that you prepared the kits, if that’s how your freezer system works. To each bag, add one sauce, one veggie, one garlic, and one protein. Now they are ready to be thrown into the freezer! I assembled 8 kits (only 7 actually went into the freezer, and one was for dinner that night) in about 3 hours for just $8 each. 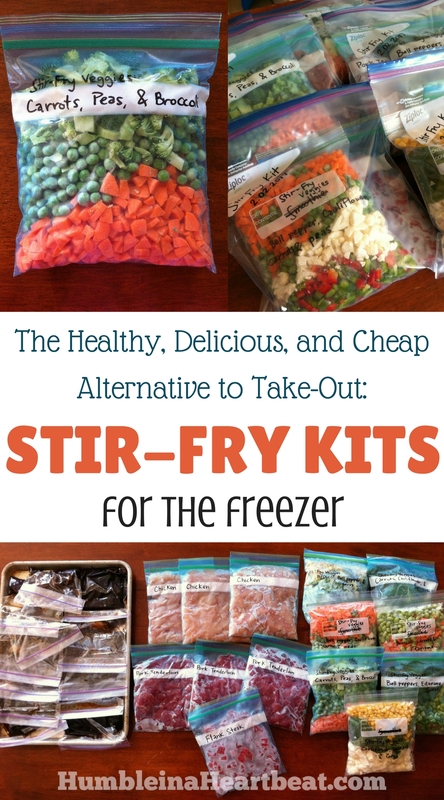 Now it’s time to show you how I made these freezer stir-fry kits for just $8. I did not shop sales or use coupons (I rarely do these days), so I know that you can probably make these for even less. It’s also possible that you could pay more for these kits, especially if you live in a higher-cost of living area and/or you buy a lot of organic produce and free-range meat. I bought the majority of the ingredients from Walmart (I normally don’t shop there, but the day that I did the shopping I was at my mom’s and the closest and cheapest store to her house was Walmart). I also went to WinCo for a few ingredients and to Costco for the meat (which leads me to explain that I normally buy my meat at much lower prices than I did for this post, but I sent my husband to buy the meat and he never looks at the price). For a lot of the ingredients, I just left the cost of the entire ingredient, even if only a small portion was used (i.e. the recipe only calls for 4 Tablespoons of cornstarch, but I listed the entire can at a cost of $1.30). The reason is because it is a sunk cost once you buy it. You may or may not use the rest of that ingredient in the future. Of course, you’ll be saving money by using it up in another recipe or even in future stir-fry kits. I rounded down to $8 simply because I had rounded up for several of the ingredients, and I paid much more for the meat than I usually do, so I know the cost could have been lower than $8 and likely in the $6 range. Take the kit out of the freezer the night before you plan to make it. UPDATE 06/2017: You can remove just the meat from the kit the night before and put it in the fridge. Then you can get out the veggies and sauce right before you are going to make it. I’ve found that this keeps the veggies from getting mushy and tasting less fresh. When you are ready to cook, get the protein out. Put a skillet or wok over medium high heat and add 1-2 T. oil. Add the protein and let it cook for 3 or 4 minutes. Push the protein aside and add the garlic. Let it saute for about 30 seconds, then add the veggies. Stir everything around and cook for about 10 minutes, making sure the veggies are no longer hard. If the veggies start to burn, add a bit of water or stock to the skillet. Now push all the veggies and protein to the sides so there is a hole in the middle of the skillet. Add the stir-fry sauce in the hole and let it bubble for 30 seconds or so, and then stir it into the protein and veggies. That’s it! 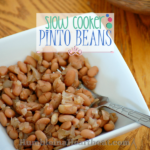 I am so excited to be able to make a healthy meal for my family, once or twice a week, that requires a minimal amount of time to pull together once I put in the initial effort. Do you make stir-fry in your home? Get a shopping list and the recipes! Want more ideas to get dinner on the table fast? 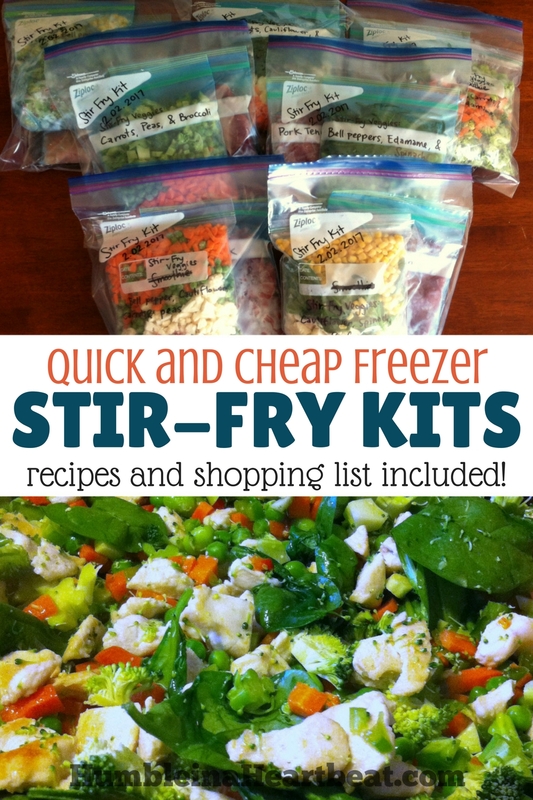 Sign up now and get the shopping list and recipes for these freezer stir-fry kits! Awesome! Check your email for your shopping list and recipes! Did you blanch the vegetables? I did not. You’re definitely welcome to do that, and I found this guide to blanching vegetables before freezing them if you’re interested: http://preparednessmama.com/blanch-vegetables/. I’ve successfully frozen these kits before and had no problem with a change in texture or taste. Of course, one of the purposes of blanching the vegetables before freezing is to preserve nutrients, so it’s possible that if you don’t blanch some of the vegetables your stir-fry will not be as healthy as if you made it fresh. Thanks for bringing this up, I didn’t think about it when I was going through the process of making these kits. Love this idea, I also sometimes don’t even want or have the time to chop vegetables or spend hours in the kitchen. 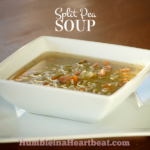 All I want is something easy to throw together but that it’s also hearty and delicious that my family will like. We love stir fry at my house, so this is great! Awesome! Glad you like this, and thanks for stopping by, Ros Emely! Approximately how many people does each kit feed? I’m single and don’t like lots of leftovers. Sorry I forgot to give that info in the post. Each kit feeds 3-4 adults. I am going to have to try this, it’s a great idea to make the kits to have ready. 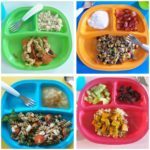 It’s only my two kids and I so we don’t eat a whole lot, these would be a great way to make sure we aren’t letting food go to waste. Any extra veggies in our house I can just chop and make into stir-fry mixes. 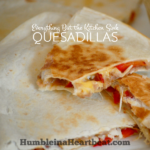 Thank you for sharing this, and for sharing your sauce recipe. Yes, excellent idea. Freezing veggies or protein that you may not be able to use in time is a huge money saver! This may be obvious to others but I just want to be sure. When you said “Take the kit out of the freezer the night before you plan to make it.” Do you mean put it in the fridge or on the counter? I assume fridge since there’s meat it in, but will everything be thawed in time to be cooked, or are things still frozen when they go into the wok? I’m going to try this, but also add the rice or noodles. I can just see me forgetting that need that and then I’ll be out of it!!! How many oz of meat should I put in each bag? I put 1 lb. (or 16 oz.) in each bag. I feel like this is so obvious… but when you say Season the protein and cover it, you mean just Salt and Pepper right? I’ve re-read to see if I have missed a step, but I don’t think I did. Yes, salt and pepper. Sorry for the confusion, Natasha! I will change that in the directions. Love this idea. Ever try sprouts, waterchestnuts, celery, or bamboo shoots? 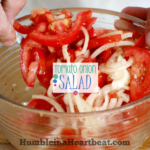 Is there a trick to picking your types of veggies? I have only tried celery. I don’t see sprouts, water chestnuts, or bamboo shoots at the stores I shop. I just choose the veggies based on what is on sale and in season, usually. Thanks for stopping by, Laura! This is so smart! I love doing this kind of thing to save time on meal prep…and it helps avoid the urge to grab take out too on a busy day. Thanks, Lydia! I need to make more of them because they really are so convenient! i buy minced ginger and garlic.it saves alot of time .i always have it when i need it and my fridge never smells of garlic i forgot in crisper.the ginger is nice and small not woody. I LOVE stir frys and being a mom of 5 that I homeschooled, I can relate to the dinner time stress. There are some gadgets that I’ve found to be worth the space in the counter. One of those is the Vidalia Onion Chopper. Wal Mart has a different brand, but it only comes with one size of cutter. The Vidalia Onion Chopper has 2. This is a GREAT gadget for chopping all those food items for stir frys. That’s a great recommendation, Sandra. I have never used a chopper before, but it would be worth it for something like freezing meals.